I have had a half finished mosiac top sitting around for a few months. I had given up on finishing it. Since it was not glued yet I figured I might just use the pieces in another project but decided that I should finish it. I filled in all the shapes three weeks ago and began building a base for it two weeks ago. I made the apron from some scarap piece of cedar I had in the wood pile and made the legs out of some old oak star balusters that I painted black. For addied stabiilty I added a 3/8 ” dowel on the narrow side. 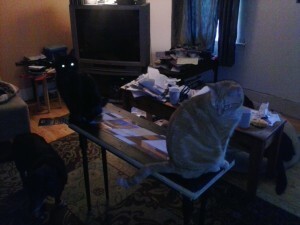 I assemebled the base and apron today and it wobbles a bit, though it supports the weight of two cats. 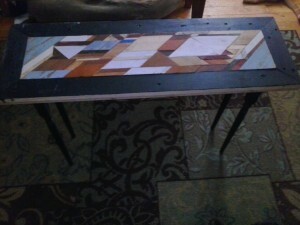 I think I need to add a dowel on the long side. The table stood over 3′ tall, I decided that was too tall and so I knocked about 7″ off the legs. I had an interesting time cutting the legs down to size, I marked the height I wanted on a dowel and used that dowel to mark each leg, then I cut it with a circular saw. I had to cut left handed so I could see the blade and the cut mark, good thing I am ammbidexterous. Somehow the legs ened up level, It wobbles less now that it is shorter but I still need to add some extra support. Making bases that will support the weight of the tops, and not succomb to vertical or horizontal pressure is always a challenge. It still may be too tall. I am not sure. This entry was posted in barn board, old projects, repurposeing, scrap wood, tables, tables for sale, wood working by brighid. Bookmark the permalink.